I have repeatedly blogged about my concerns with the current and future energy codes because the codes are not keeping up with technology for lighting efficiency (see my previous blog posts titled “Why are Lighting Energy Standards Decreasing” and “More Issues with the Energy Code – Lighting is Running Rampant”). 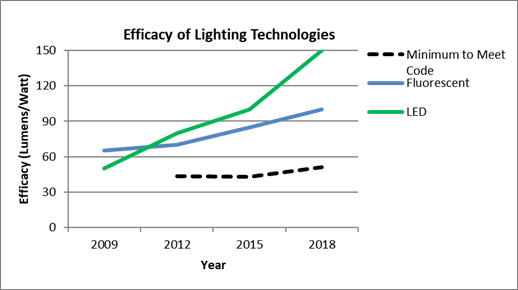 The graphs below, developed by our friends at Optimal Energy, show some comparisons of Department of Energy (DOE) predicted efficacies for lighting technologies and the efficacy needed to meet code for some common space types. 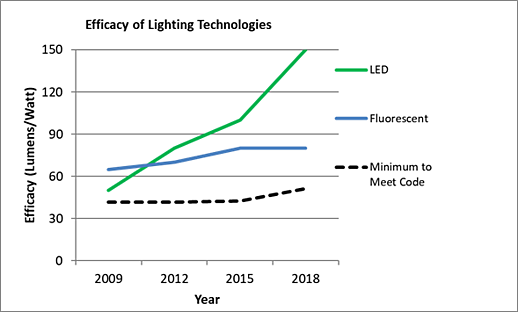 What these graphs demonstrate is that we can exceed the 2018 code lighting power density (LPD) requirements using technology that is 10 years old. The American Institute of Architects (AIA) and American Society of Heating, Refrigeration and Air-Conditioning Engineers (ASHRAE) have taken leading roles in moving members of the architecture and mechanical engineering communities to embrace energy efficiency, high performance design and buildings that become solutions for our future rather than a burden for our children. Unfortunately, the Illuminating Engineering Society of North America (IESNA)is not on board with taking responsibility for aggressively seeking to reduce the environmental impacts of our built environment. I am an IESNA member and regular reader of the LD&A magazine which frequently includes commentary complaining how the energy code is restricting design. When I started my design career in San Francisco in the early 1980s, Title 24 was the only energy code in the country. Title 24 included an LPD allowance of 2 watts per square foot that we were meeting with T-12 fluorescent fixtures with magnetic ballasts – the best available technology at the time. Partly because of Title 24’s work and the large lighting market in California, manufacturers innovated better lighting products which the market embraced. These products enabled designs to achieve quality lighting using much less power. Designs that include 30 watts per square foot for atrium lighting (but comply with the code overall because the allowances are so high that it looks like an efficient design). 10 kW of connected lighting load over lobby windows that will cost the building owners $13,000 annually to operate. Far more lights than are necessary to create a high-quality environment, adequate illumination on tasks and interest in the environment. This means higher first cost and higher operating costs for the lifetime of the lighting system. As lighting professionals, we need to hold ourselves to the same high standards that other design professionals are embracing. We can be the solution for the future rather than barriers to high performance design. Let’s not trade off 30% of the building energy use reduction for lighting below code to offset worse windows or excessive lighting. Let’s accept the fact that our planet is in a crisis and our job must include lighting for the future which means lighting with less input energy. Open office LPD allowances should be between 0.35 and 0.4 watts per square foot. Corridor LPD allowances should be between 0.45 and 0.5 watts per square foot. Small office LPD allowances should be between 0.4 and 0.5 watts per square foot. Let’s have the code actually represent the baseline for new construction lighting and stop energy efficiency programs from having to establish their own baselines through market research – Massachusetts, ranked the #1 state in energy efficiency by the American Council for an Energy-Efficient Economy (ACEEE), is the only state I’m aware of that is doing this. That means that Massachusetts, with the best programs in the country, also holds itself to a higher standard than everyone else when it comes to claiming lighting savings from new construction projects. Let’s not remain in the dark ages of energy code LPDs. The lighting design community needs to get with the planet and embrace the lower LPDs that we can achieve with today’s technologies.